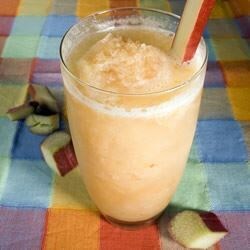 "This is a refreshing spring time beverage. It is also a great way to use up all that fresh rhubarb. Alcohol is optional." Stir together the rhubarb puree, sugar, orange juice concentrate, lemonade concentrate, gin and water. Freeze. Place scoops of the frozen mixture into serving glasses, and fill the rest of the glass with lemon-lime soda. Watch how to make this delicious rhubarb dessert! Instead on gin I used Maui Tropical Schnapps & that added a nice extra flavor to it. Very good way to use up your Rhubarb! My company found this drink (I made it virgin) very refreshing. I plan on keeping a batch in the freezer for unexpected guests. Great way to use your rhubarb! Sooo delicious and refreshing! I'm always going to have a batch of the slush on hand for company or a refreshing treat for myself. Thanks so much.